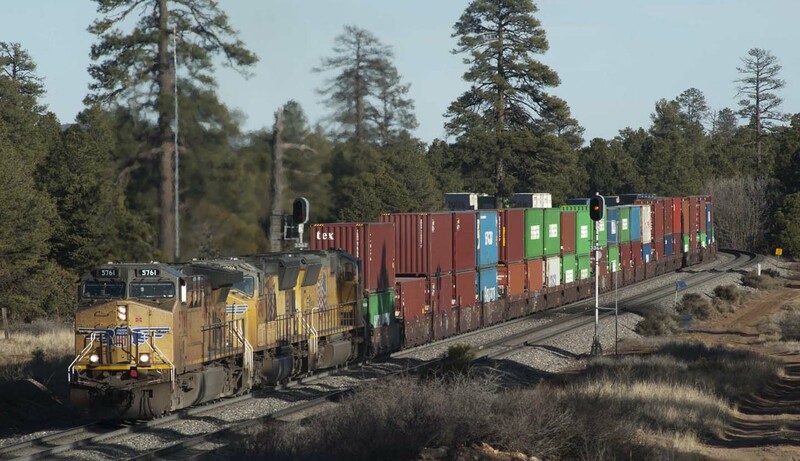 During the past two weeks, Union Pacific has been detouring trains along the BNSF Transcon route through Flagstaff. These trains are intermodal trains IDALB (Dallas-Long Beach) and KLBNS (Long Beach-Dallas/KCS*), operating almost daily on BNSF between Sweetwater, TX, and Barstow, CA. Pictured above is UP train IDALB1-13 westbound at Milepost 336 east of Flagstaff on Feburary 14, 2015. These trains provide a nice contrast to the BNSF locomotives normally seen in our area. Observation of real railroads is immensely instructive for model railroaders, and this photo is a great example. First, notice the scenery. Shrubs growing at the edge of the ballast. The dirt access road with ruts made during the last rain. A dead pine tree in the background. Next look at the track – immaculately profiled ballast shoulder, welded rail, and concrete ties all serve to tell an observer that this is a heavy duty mainline route meant for business. Now focus on the trackside equipment. The antenna behind the lead locomotive is new, part of the ongoing installation of Positive Train Control technology. Behind the right signal along the track are a solar panel for recharging the batteries (in the vault on the ground) which power the track circuits for the automatic block signals (ABS), then markers for buried cable, and then a yellow speed limit sign (passenger train speed limit on top, freight limit underneath.) Note the milepost number sign attached to the signal mast. All of these oberservations are instructive for static modeling, and all contribute to the “story” illustrated by either a prototype or model scene. But…Do not discount the drama inferred by the moving train or the lit signals. The Union Pacific locomotives illustrate a detour move, one railroad’s trains utilizing another railroad’s route due to unplanned events (weather or derailment) or planned track maintenance (it is the latter in this case.) This type of event can be included in a model railroad operating session, a great way to include locomotives from other railroads (we call them “foreign power”) and also add another train movement to the lineup. The yellow block signal on the south main track tells us we have just missed an eastbound train, or a westbound train is approaching but is more than one signal block away. Operating signals on a model railroad are more than an animated novelty, they convey information to govern train movements just as on the real railroad. Finally, do not ignore the train itself. The containers are all 40-footers bearing names of ocean shippers – a sure sign this train is headed to a West Coast port, something we could infer without knowledge of the train symbol (a train symbol is a train’s unique identification.) Paying attention to car types and loads when building model trains can lend much more realism to operations, as the trains themselves tell a story about what service they provide, and where they travel. This entry was posted in Flagstaff Railfanning. Bookmark the permalink. I am not sure this is the “contact” page, but I will try to contact the club anyway. My name is Bill Ellis. I am from Scottsdale and a member of the “Sun-N-Sand” model RR club at McCormick ranch. I run “N” scale model trains. I would like to visit your layout as a “visiting member” and run some of my trains if possible. If this is possible, when is the layout open for operation. I’ve visited the layout before and seen the “N” scale layout. We have an open house on the 1st Saturday of each month, except August, from 10am-12pm. We have an “open run night” on the 1st Tuesday of every month, 7pm-10pm. Other than these times, we are not prepared to host visiting equipment. Our N-scale portion of the layout is not running very much, and has several track issues. You are always welcome to visit us.